Barrick Gold Corporation (USA) (ABX), Yamana Gold Inc. (USA) (AUY): Time to Buy That Falling Golden Knife? The world of gold is quite lively these days. Sudden mine closures and falling gold prices are causing havoc in the market. Gold is a safe-haven, a place of security that people look to in times of political and financial upheaval. Until another disaster strikes, gold’s prospects look rather dim. Why is the price of gold falling? The above chart shows the VIX; a measure of volatility and risk. When the VIX is high there is a large amount of instability in the market. In the past year the VIX has consistently stayed below 26 and risk apatite has increased, decreasing the demand for safe havens like gold. A recent report (pdf downloads on click) by the World Gold Council shows how investor and central bank purchases of gold have grown from a net negative in 2003 to a net positive. 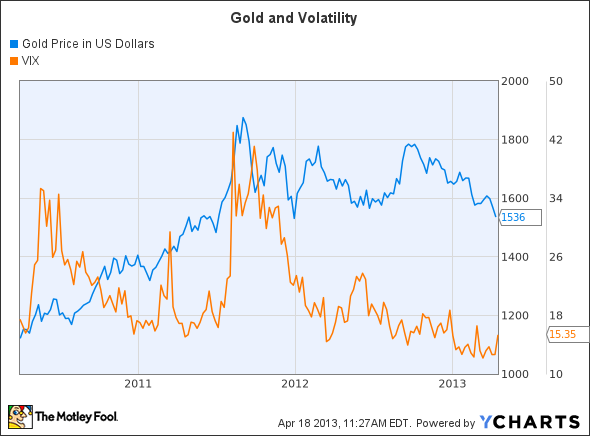 This means that fickle investor risk preferences are driving more volatility into gold prices. What does this mean for the miners? Barrick Gold Corporation (USA) (NYSE:ABX) is one of the world’s most public gold miners. Recently the Chilean government paused work at its Pascua-Lama mine on the Argentinean-Chilean border. The company can still continue some work in Argentina, but this recent legal action is a major setback for the firm. In 2012 the all-in sustaining cash cost was $945 per ounce. Other miners have lower cost operations, but at least Barrick Gold Corporation (USA) (NYSE:ABX) is still profitable. Its costs are still a couple hundred dollars away from the August, 2013 futures price around $1400. This company is a very speculative investment and it is not clear when it will stabilize. It has a major debt load with a total debt to equity ratio of 0.64. It may be forced to sell off assets if gold prices do not improve. Even though it is trading at a discount with a price to book ratio of 0.81, this company is too risky for comfort. In many ways Yamana Gold Inc. (USA) (NYSE:AUY) is in a better situation than Barrick. It has almost no debt with a total debt to equity ratio of just 0.10. Chile is a very well-run nation and 47% of Yamana’s 2012 production came from the Andean country. Chile’s decision to temporarily stop Barrick’s production is really a positive. It shows that country has grown and is able to solve grievances through the legal system. When a nation is unable to work out grievances through established legal means, then tensions can grow until nationalizations and coup d’états occur.